After the independence of India in 1947, Pakistan was divided into two wings – East and West Pakistan. The people of East Pakistan - who were predominantly Bengali – increasingly felt economically and culturally oppressed by West Pakistan. In 1970, the political party Awami League representing the aspirations of those in East Pakistan, who sought greater autonomy, won the elections for the whole of Pakistan. 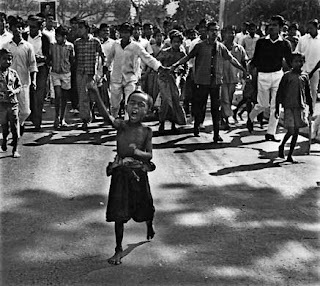 However, West Pakistani leaders refused to establish the Parliament, and on the night of 25 March 1971 its army initiated a military crackdown named “Operation Searchlight” in Dhaka, killing thousands of people in the city including students in Dhaka University campus. This was the beginning of the war that resulted in the creation of Bangladesh out of what was East Pakistan. It is known as the Bangladesh Liberation War or War for the Independence of Bangladesh, which lasted for nine months until the surrender of Pakistani forces on 16 December 1971.